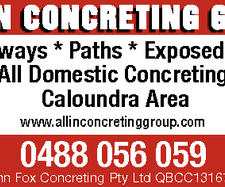 We are a long established family operated concrete business. We offer free quotations and consultation on your concrete around your home. We have many testimonials and local properties you can inspect our workmanship. We specialise in exposed aggregate driveways and paths. Slabs for sheds, caravans and boats.